Stride Gum has launched a new mission to support classic American arcades called Save the Arcades 2, and you can help choose the winner just by playing an old-time videogame. For most people, the arcades of yore are a fading memory. Lights, noise, crowds and row upon row of classic stand-up machines: Paradise for a handful of quarters. But home consoles spelled the end of most arcades and those few that remain, catering those few who still have a taste for that sort of thing, are often run on a shoestring. Enter Stride Gum and Save the Arcades 2, through which the company will donate $25,000 to one of three arcades in the U.S.: Ground Kontrol Classic Arcade in Portland, Oregon, Rocky's Replay in Winter Park, Florida or Arcade Infinity in Rowland Heights, California. And who picks the lucky winner? You do! Sort of, anyway. 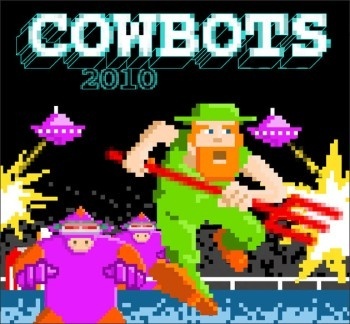 It's like this: Go to www.savethearcades.com, check out the profiles of all three arcades and then fire up a game of Cowbots 2010, an old-school action game that pits "man against moochine." (Does it look at all familiar? If so, you're probably old.) Rack up the best score you can, then donate your points to the arcade of your choice. Whichever of the three has the most points on June 15 takes home the money! "Many iconic arcades across the country have closed their doors, leaving few places for true gamers to play the arcade classics they love," said Stride Marketing Manager Nipa Shah. "We've launched Save the Arcades 2 to encourage fans to support this classic American pastime and ensure these incredible games won't be forgotten." It may sound like pure marketspeak, but give Stride credit for having some legitimate gamer cred. After all, in 2008 the company promised to give away a million free packs of gum if at least a million people signed an online petition asking infamous movie director Uwe Boll to stop making movies. That has to be worth something.